This essay deals with the life of “the messiah of the downtrodden” with reference to his political role as a nationalist who relentlessly fought against caste prejudices against the Dalits. In order to highlight his role as the architect of a Socialist, Secular, Republic of India, this essay dwells on those issues which remained critical for Ambedkar during his participation in the nationalist movement and give him an inevitable place in the Indian Nationalist History. In this sense, the essay seeks to grasp Ambedkar’s ‘libertarian ideology’. Following text described various aspects which explain the relevance of Ambedkar’s socio-economic thought and its impact on Indian history. Firstly, untouchability, according to Ambedkar, had the most destabilising influence on Hindu society. He delved into the ancient texts of Vedas and shastras to understand the roots of untouchability. He was convinced that these texts were distorted to fulfill the partisan design of the elites for subjugating those who were identified as untouchables. According to him, Manusmriti was a constructed text that perpetually held the untouchables as inferior in social terms by deliberately distorting the ancient Hindus texts. By critiquing Gandhi who endorsed Chaturvarnya, Ambedkar elaborated his views sharply. This is an interesting chapter in his socio-political thought. According to him, Gandhi’s support for Chaturvarnya was nothing but a design to perpetually enslave the untouchables. Babasaheb’s diatribe against Gandhi and Hindu society was articulated in his lecture, ‘Ranade, Gandhi and Jinnah’. The lecture has two clearly defined parts. On the one hand, Ambedkar evolved his critique of Hinduism by drawing extensively on Ranade’s view on Hinduism. The second part dwells on his criticism of the role of Gandhi and Jinnah as political leaders of “the respective groups of Hindus and Muslims” in India. While appreciating Ranade for his critique of Hinduism, Ambedkar stated that Ranade was the first Indian politician who argued that “there were no rights in Hindu society; there were privileges and disabilities, privileges for a few and disabilities for a vast majority”. Linking this argument with his criticism of Gandhi, Babasaheb felt that there was no alternative for the Mahatma but to support Hinduism and caste system simply because “Mr Gandhi wants the untouchables to remain as Hindus… not as partners but as poor relations of Hindus”. Characterising Gandhi as “a Tory by birth as well as faith” because of his rigid views on socio-religious issues, he accused the Mahatma of “demoralising” his followers and also “politics”. According to Ambedkar, the collusion between Brahminism and colonialism was possible because of the support accorded by Gandhi. 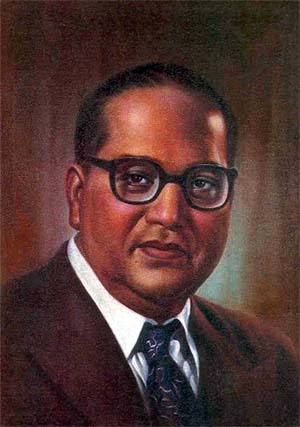 Ambedkar being the first mass-leader of dalit movement formed the basis of a big political movement in modern India. Thus, Ambedkar’s place in history can never be questionable as a ‘messiah of outcastes’. The other highlighting aspect of Ambedkar’s socio-economic thought relates to Ambedkar’s justification for Partition. In his book, Pakistan or the Partition of India, Babasaheb endorsed the claim for Pakistan in terms of realist politics. According to him, Partition was possibly the best solution to resolve the constitutional impasse in India for two reasons. First, given the hostility of Muslims to the idea of a single Union Government, inevitably dominated by the Hindu majority, it was certain that if there was no Partition, the animosities and suspicion between the communities would remain. “Burying Pakistan is not the same thing as burying the ghost of Pakistan,” he says. Furthermore, given the demographic composition of what was proposed as Pakistan, there was no doubt that it would be a homogeneous state and hence free from communal bickering and mutual distrust. Second, Ambedkar felt that in united India where more than a third of the population was Muslim, “Hindu dominance could be a serious threat to the very existence of the polity”. In such a state, Muslims apprehending the tyranny of the Hindu majority were likely to organise themselves into “a theocratic party”, provoking in turn the rise of Hindu fundamentalism. Ambedkar’s fore vision was for a peaceful, violence free India and what he could foresee at that time is visible in the present times. Thirdly, Babasaheb Ambedkar is principally known for his voice raised for upliftment of Dalits and down-trodden section of society and the work he did for them. Secondly, he is remembered for his ability and competence as the Chairman of the Drafting Committee of the Constituent Assembly, formed to frame the Constitution of India. Indeed, his both of these works were of great importance and every right thinking and righteous Indian is proud of his performance and had profound regard for him. However, Dr. Ambedkar’s endeavours and works of upliftment of Dalits and other weaker sections of society and as architect of Indian Constitution is not the only introduction of his personality. In fact, it is only one aspect of his personality. The other side of his personality can be evaluated as seen through his thoughts, understanding and suggestions for land reforms in this predominantly agriculturist country, foreign policy, the State of Jammu and Kashmir in particular, and his work for strengthening nationalism in India. It is an irony that most of the people are acquainted with only one aspect of Ambedkar’s life and works. It is also ridiculous that even this side of his personality is used for fulfilment of pure political purposes. As Dr. Ambedkar never used politics for personal gains, it is wholly unjustified to use his name to meet political ends. Besides this, it is not proper to ignore the other side of his personality particularly in view of over all national interest. Dr. Ambedkar’s proclaimed determination in favour of Indian nationalism is reflected in his often repeated words, “I am an Indian, India is my motherland and nothing is supreme than this to me” and it is a self proven fact too. However, there were many other occasions when his determined stand in favour of Indian nationalism proved that he was a patriot par excellence. No essay, however, will be complete without assessing the role of Ambedkar as the chairman of the drafting committee which prepared the Constitution of India. Truly christened as the architect of the Constitution, he was also aware that this Constitution, despite having codified rules for protecting the downtrodden was not adequate to completely eradicate caste prejudices simply because of the well-entrenched vested interests in their favour. According to him, social equality remained a distant objective because “we have in India a society based on the principle of graded inequality which means elevation for some and degradation for others”. Unless this was rooted out, India could never become, he warned, “a nation in the socio-psychological sense”. Ambedkar was perhaps hinting at the hegemonic importance of ‘Manuwadi’ in every walk of life. It became evident with his resignation from the Cabinet over the Hindu Code Bill, which was abandoned by then Prime Minister Jawaharlal Nehru since “the opposition to the Bill was very strong”. Undoubtedly, Ambedkar was a champion of social reforms, a great nationalist and a patriot. History of Indian Republic and Socialism emanates from Ambedkar and not Ambedkar forms a part of History.